Q81. 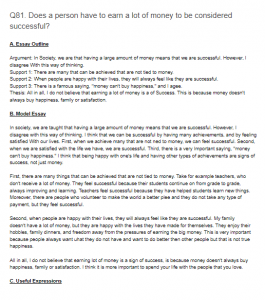 Does a person have to earn a lot of money to be considered successful? Argument: In Society, we are that having a large amount of money means that we are successful. However, I disagree With this way of thinking. Support 1: There are many that сan be achieved that are not tied to money. Support 2: When people are happy with their lives, they will always feel like they are successful. Support 3: There is a famous saying, ”money can’t buy happiness,” and I agee. Thesis: All in all, I do not believe that earning a lot of money is a of Success. This is because money doesn’t always buy happiness, family or satisfaction. In society, we are taught that having a large amount of money means that we are successful. However, I disagree with this way of thinking. I think that we can be successful by having many achievements, and by feeling satisfied With our lives. First, when we achieve many that are not ned to money, we can feel successful. Second, when we are satisfied with the life we have, we are successful. Third, there is a very Important sayIng, ”money can’t buy happiness.” I think that being happy with one’s life and having other types of achievements are signs of success, not just money. First, there are many things that can be achieved that are not tied to money. Take for example teachers, who don’t receive a lot of money. They feel successful because their students continue on from grade to grade, always improving and learning. Teachers feel successful because they have helped students learn new things. Moreover, there are people who volunteer to make the world a better plee and they do not take any type of payment, but they feel successful. Second, when people are happy with their lives, they will always feel like they are successful. My family doesn’t have a lot of money, but they are happy with the lives they have made for themselves. They enjoy their hobbles, family dinners, and freedom away from the pressures of earning the big money. This is very important because people always want uhat they do not have and want to do better then other people but that is not true happiness. All in all, I do not believe that earning lot of money is a sign of success, is because money doesn’t always buy happiness, family or satisfaction. I think it is more important to spend your life with the people that you love.